The University of North Georgia (UNG) develops students into leaders for a diverse and global society. 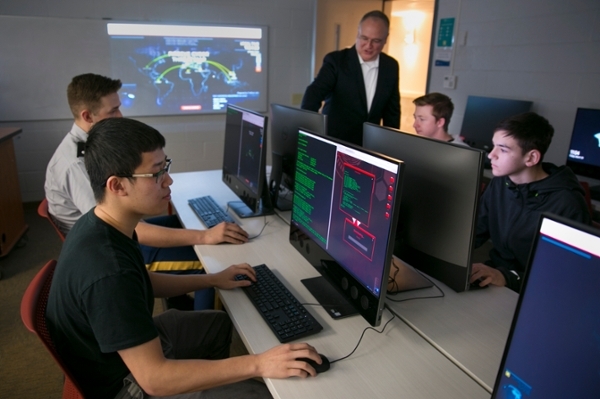 In support of that mission, the president has established the Center for Cyber Operations Education at UNG to prepare students for military and civilian careers in cybersecurity, cyber operations and cyber defense. UNG is designated by the NSA and Department of Homeland Security as a National Center of Academic Excellence in Cyber Defense Education (CAE-CDE). UNG is also designated as a University System of Georgia leadership institution and is The Military College of Georgia, one of six federally designated Senior Military Colleges in the nation. UNG offers a Bachelor of Science degree in Cybersecurity, a Graduate Certificate in Cybersecurity, two degree concentrations and two minors in information assurance and security (IAS) and cybersecurity. The Department of Computer Science and Information Systems (CSIS) has offered the Concentration in Information Assurance and Security (IAS) as part of the Bachelor of Science degree in Computer Science since 2004 and serves as many as 300 students per semester in cybersecurity courses. The Department of CSIS offers the Information Assurance and Security Minor, and, jointly with the Department of Criminal Justice, the Minor in Cybersecurity to add value to any undergraduate major across all disciplines. The interdisciplinary Bachelor of Arts degree in Strategic and Security Studies offers a Concentration in Cybersecurity for students interested in military, government, or intelligence careers. UNG Cyber Hawks – The UNG Cyber Hawks competition teams meet every Wednesday at noon in NOC 109. We practice for the Southeast Collegiate Cyber Defense Competition (SECCDC), the National Cyber League (NCL), NSA Codebreaker Challenge and similar cyber defense/cyber operations/cybersecurity events, and we discuss cybersecurity with guest speakers. Visitors who are interested in learning more about cybersecurity are welcome to attend. Guest Lectures – Dr. Tamirat Abegaz is a Certified Ethical Hacker, former Programmer with the African Union, and speaks on Computer Science and Cybersecurity. Dr. Payne is a Certified Information Systems Security Professional and Certified Ethical Hacker and speaks regularly at civic organizations and K-12 schools on computer science, cybersecurity, and technology education. To request a guest lecture, email cs@ung.edu. Cyber Leader Development Program – In collaboration with the Army Cyber Institute, UNG’s Cyber Leader Development Program offers Cadets majoring or minoring in Cyber-related disciplines the opportunity to participate in up to 100 hours per year of academic and co-curricular Cyber activities, including courses, conferences, certifications, and competitions, leading to the Army Skills Identifier SI-C1 (Cyber) upon commissioning. See CPT Kattie Neujahr (kattie.neujahr@ung.edu) for more information or to join the CLDP. "Strategic Application of Special Warfare in Cyberspace"
"Man, Computer, and Special Warfare"
"Why do Russia and Iran have More Cyber Commandos than the US?" "UW in Cyberspace: The Cyber UW Pilot Team Concept"